Check out how big this Sulcata Tortoise is! It is amazing how gigantic they can get! Tortoises are mild mannered 'turtles' that live on the land and feed almost exclusively on vegetation! When we think of Tortoises, what usually comes to mind are giant highly-domed land dwelling turtles with stumpy legs; slowly moving about minding their own business while calmly munching on some type of plant matter. Though many tortoises are quite large, such as the Galapagos Tortoise, there are in fact some tortoises that are quite small. 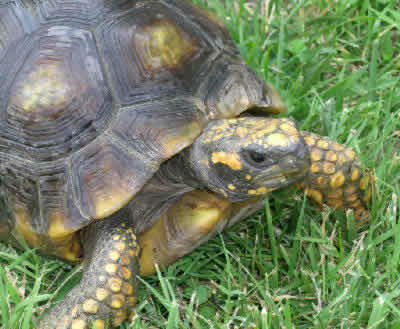 One such animal is the African Speckled Tortoise which only grows to about 4" (10 cm) long. Most tortoises do have high-domed shells (with only a couple exceptions) and they are all exclusively land dwellers eating primarily vegetation. They are quite ackward swimmers, and if they get in water that is too deep they can easily drown. They are quite long-lived, with 50 or more years not being unreasonable. Tortoises are recommended only for an experience keeper, as they can have very specific temperature and humidity requirements. Many species can get quite big and will need a large environment. They are also subject to more serious health problems than other types of turtles and many tortoises are endangered. .
Tortoises are offered for sale at pet stores, reptile shows, or through breeders; and can be moderately priced or extremely expensive.